So what’s the solution? We need a great artificial intelligence effort to comb through our information, assess the urgency and relevance, and use a deep knowledge of who we are and what we think is important to deliver the right notifications at the right time. As time goes on, we will trust such a system to effectively filter all our information and dole it out just as needed. Give it up to Eurogamer’s Digital Foundary for being an unimpeachable source for hard-core tech/processing/graphics news within the gaming community. This scoop on the Xbox One – it’s past performance and how it’s likely to evolve with the SDK changes – is a great read. New app icons for iTerm, Mailbox, nvAlt, Spotify, Sublime Text, and Tweetbot. Apple is trying to discipline the world of OS X icons. While one icon shape has been deemed insufficient, Apple believes three shapes should just about do it: circle, rectangle, and tilted rectangle…Visual simplification is the order of the day, and details that don’t read well at small icon sizes have been excised. 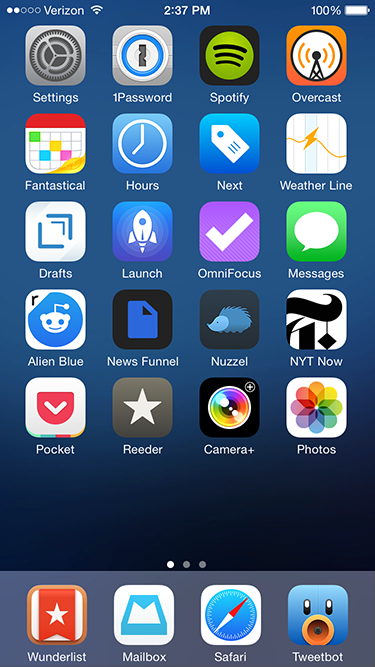 Unfortunately several apps I use heavily haven’t updated their icon and clash with Yosemite’s new look. In a sea of flat minimalism, bold colors, and thinner typography, a few icons that don’t follow trends can really stand out. So I hunted on Dribbble to find suitable replacements. Below I’ve provided a few direct links if you’re interested in grabbing them for yourself. Right/command click on the app in Finder. Select “Get Info”. A dialog box will open. In another Finder window, find the new replacement .icns file for the app. Click on the icns file and drag it over to the existing app Get Info dialog box. Release the file on top of the existing app icon at the very top of the dialog box. iTerm isn’t far off the mark but I wanted a more minimal, flatter look that better paired with Apple’s Terminal icon. Jason Long’s take is a better match. Mailbox overall looks great, but the “in construction” thin lines (albeit with good purpose to signify beta status) all over the Mailbox icon were distracting. Chris Jennings made a very clean replacement that goes well with Mailbox’s minimalist aesthetic. nvALT has a clever icon with a small stack of sheets alongside a rocket ship taking off. But it’s busy in the context of Yosemite. So I went ahead and created my own amateur work in Sketch combined with Icon Slate for output. Download it here. Spotify’s default icon already works with color and a circular shape. Yet I wanted something with a more subtle gradient, punchier color and more clearly defined edge to the icon. Sebastian de With’s Muir set was my first choice, but after using it for a few days the white coloring for the icon’s sonic waves felt off from Spotify’s black aesthetic. So I switched to Jean-François Goncalves’s work. It’s very similar, but with black instead of white accents. The great Iconfactory put together Sublime Text’s “big button” style original icon, yet it never resonated with me; it was just a bit too “cute” for my tastes. I’ve used other replacements while on Mac OS 10.9, but for Yosemite I’ve settled on a simple tilted rectangle icon from Rafael Conde. I love the subtle cross hatching on the icon’s background. Tapbots have always had a playful and original bent to their wonderful Tweetbot app; that gives some creative license away from Yosemite’s usual icon layout. But Ilja Miskov put together an option that plays better; it mirrors Tweetbot’s simpler iOS icon cropped to circular form for Yosemite. Here is the gigantic, crucial difference between piracy and streaming. In piracy, we don’t have listening numbers: we don’t know if an album downloaded for free was listened to 100 times or 0. A download might represent a lost sale or it might represent a listener adding to an endless collection or sampling one album among dozens, as if hearing the song on the radio. We really have no idea. But with streaming, we absolutely know. The statistics are right there. And artists should be paid accordingly: maybe not $10 a fan, but definitely more than a few pennies. There’s a cold ratio at play here: the less popular a band is, the more money they need to generate per fan to reach a break-even point. However, the more popular a band is, the more ways they have of generating money per fan — and often they can generate more money per fan anyway, with deluxe packages at shows and branding opportunities, especially if you consider corporations to be people, as the Supreme Court does. It is a fundamentally unfair marketplace that privileges the already successful, which is rarely the path to innovation — or interesting art. Three years after the death of its charismatic founder, Apple is doing all it can to maintain this reality distortion field, mainly by exercising total control about anything that is reported about the company or its products. In contrast to Apple’s design philosophy this strategy does not manifest itself through clarity and elegance, but through a subtle and sometimes questionable toying with our, the reporting journalists’ vanities and dependencies. If you write positively you’ll be wined and dined, if you criticize, no matter how fairly, you’ll be penalized. Admittedly this is common practice with large corporations, but hardly any one of them will go as far as Apple does. And there is no other corporation that the media have allowed to get away with this kind of manipulation for such a long period of time. As much as we all admire Apple in many ways, it’s interesting to get a much harsher perspective on its treatment of the media. I question if it’s quite as black and white as Krautreporter portrays here, but there’s been many times where I’ve questioned the relationship between the tech press and Apple.